When the original Forge mode was released back in 2007, who could have known the impact it would have on Halo? 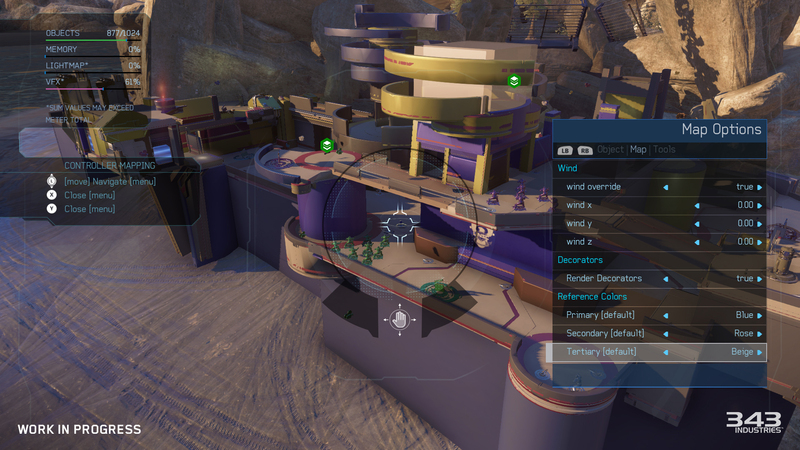 More than just a map editor, Forge allowed players to collaborate with one another and create brand-new, unique experiences in a multiplayer session. For the first time, friends could test a map live while it was being built. This empowered creativity, allowed for rapid iteration and led to the discovery of all sorts of happy accidents. Best of all, building in Forge could be as fun as playing the game. 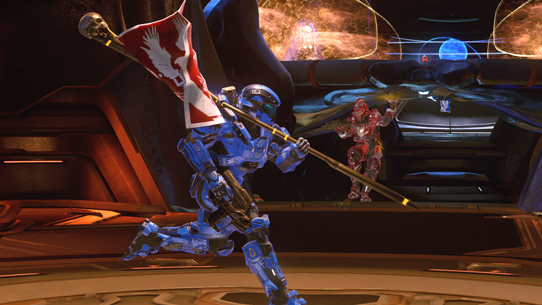 Halo players embraced this new tool, letting their imaginations run wild. Since then, some of the most fun and creative ideas in Halo have come directly from the community, via Forge. 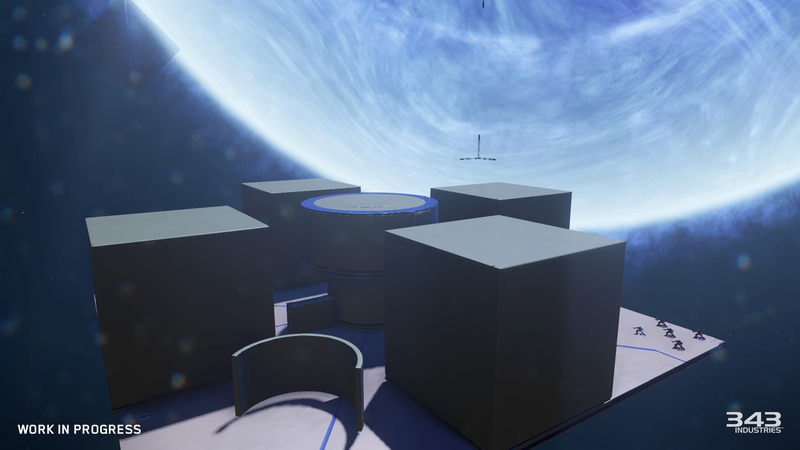 For Halo 5: Guardians, we knew we wanted to take a giant leap forward with Forge. The creativity of the Forge community knows no bounds and our goal was to give them more power and control than ever before. We wanted to remove as many constraints as possible so they can create high quality maps that rival the ones that we are shipping with the game. Last month, we brought a group of five Community Cartographers (Forgers) to the studio to spend time with the Forge team and get hands-on with the new tools. Over the course of a week, each cartographer worked on a new map. It was amazing to see how much they were able to accomplish in such a short amount of time. Throughout their visit, the cartographers provided feedback and feature requests that were then turned around in nightly updates from the Forge team. We had a camera crew on site to document this week-long collaboration and we’ll be sharing that footage in the near future. In it, you’ll see many of the new Forge features in action. For a small preview of what’s to come, check out the below video. 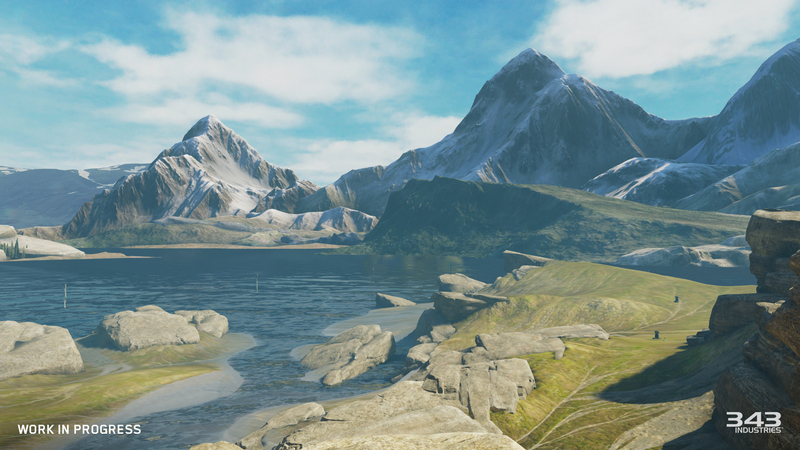 We’ve been using Forge internally A TON; battle testing it while we build new maps to push on the new feature set. Along the way we’ve made Forge fans out of people who weren’t fans before. Simply put, while still maintaining the core identity, the new Forge really feels a lot like a new tool that will improve the way maps are built with it. Before we began delving deep into implementation of feature list, we knew our first revision needed to be to updating the core controls of Forge so every system had a solid foundation we could extend from. This was arguably one of the most important foundational shifts we needed to make, so we had to get it right. In the beginning, my engineering partner Ben and I met and drew on whiteboards to work through ideas and break down changes. Ben would then head back to his desk and soon we’d have a new iteration up and running to try. We ended up experimenting with probably a dozen different methods but none of them felt right to us. Everything we tried wasn’t fluid enough for us because we were trying to cram things into the previous control schemes. After taking a step back and taking a weekend to soak on it we came back and put the new ideas up on the board. A few days later Ben had new controls hooked up that finally worked. Improved Control Scheme – Revised controls keeps users hands in the default “home” position so there’s less reaching for buttons which speeds up the building process. Don’t worry long-time Forgers, it took the Forgers we brought in a little bit to get used to but even the most hesitant were soon up and building maps at full speed. Multi-Select/Edit – Users can select and manipulate up to 64 individual objects at one time (more if combined with Groups); movement, rotation, property editing, everything you’re able to do to a single object. Free Camera – The camera no longer snaps to objects being edited. Users can freely position the camera to find the best vantage point to edit from. To orbit around selected objects like past Forges, simply click the right-stick to “lock on” to the objects and click again to cycle between multiple zoom levels. Contextual Control Helper – This lets the user see, in real time, what each controller input does. Users can change from “basic” settings to learn the ropes, “advanced” for the power user controls, or turn the helper off once everything becomes second nature. Grid/Rotation Snaps – Switch between multiple grid/rotation snap settings quickly to help align objects perfectly with each other. The bulk of the Forge specific assets are built to a grid so they interact perfectly with each other, making building even easier. There’s even a very small grid snap that can be used to fix z-fighting without making “bumps” or very precise grid editing. Precision Editing – Precision editing returns to enable fine tuning of object placement. On top of that, there’s a power user trick we call “double analog” precision that allows for even finer manipulation. Smart Magnets – Magnets no longer snap objects while moving them around. Instead they draw connection lines between magnets that will snap when the input is released. Additionally the camera can be aimed at magnets to influence which ones will snap giving extra precision when building with magnets. 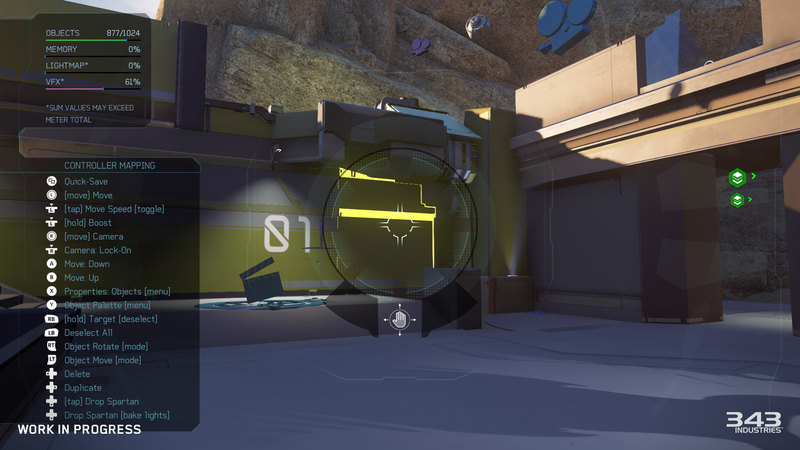 Grouping a collection of objects together to essentially make them behave like a single object is a brand-new feature, and one of the most powerful in the Halo 5 Forge suite. Built an awesome base on one half of a map that you want to put on the other side? Group it, dupe it, stamp it down, and maybe place another one for good measure. Grouping – Groups can be created dynamically with a single button press. Select more objects and press the button again to add to the group or press the button again to split the group up. It’s really that simple. Welding – Grouped objects can optionally be welded to their “parent” object. This allows them to all physically move around together; make a soccer ball with traffic cone spikes that rolls around, or attach a weapon pad to a larger animating object. Our producer Mike loves to remind Ben that this feature is so important to make some of our Arena map designs work that it is LITERALLY the reason he was brought aboard. Good thing it happened because Forge is better because of the addition of both! That’s just a small sample of what Groups bring to Forge! We have bunch of functionality planned for them that will be discussing in the future that makes them an even more useful tool in user generated content. Every object in Forge is new. This doesn’t mean your past Forge favorites aren’t returning, it just means they’ve been rebuilt and brought up to meet the standards of the Xbox One. 1600+ Objects – Take that in for a minute. Previous iterations of Forge had a couple hundred. Shaun, Randal, and Ryan on our art content team have been crazy busy building LOTS of pieces from primitive shapes, structure parts, accent pieces, detail props, and gameplay objects custom built for Forge. Mix them in with things like the weapons, turrets, and power-ups makes this Forge have pretty much the ultimate building block set you wished you had when you were eight years old. I’ve been working with our art lead Wade to try and squeeze in a few last assets before we’re done; that said we’re in pretty great shape. New Object Types – We’ve added lots of new types of object types to Forge this time; FX emitters, decals, invisible blockers (big community request), chroma screens for machinima makers, objects for building map intros/outros, and yes, even a large adorable whale toy that we love dearly. Projected Terrain Pieces – Our new terrain pieces sample textures from their position on one of our Forge maps which makes them blend in almost seamlessly with the prebuilt terrain of the level when you mix them together. Watching them move around the map for the first time generally breaks people’s brains for a few minutes because it looks like voodoo. I don’t think it’s actually voodoo but instead it’s a lot of complex graphics code which might as well be. 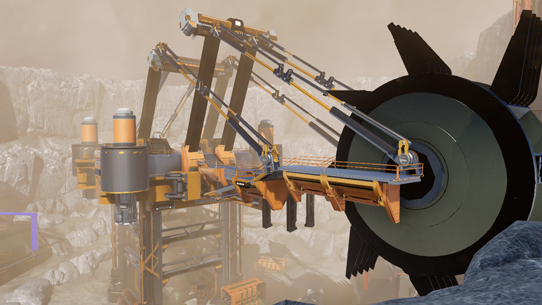 Unconstrained Objects – We’ve maintained keeping all of the objects in Forge “map autonomous” meaning any object can be placed on any map thanks to our engines new asset management systems. Now users can experiment and try pretty much any idea on any map. For example if you wanted to you could place a Scorpion tank in the middle of Truth. This doesn’t mean you should, but you could. Object Enhancements – Lots of the returning objects have new features and improvements: Dial in the amount of extra clips with weapons. Man-Cannons and Grav Lifts launch distances and heights can be tuned in their properties and show the path where the players will go when used. Teleporters output directions can now be changed it displays which way players come out facing. We have commitment to improving everything Forge, not just the new. Arbitrary dollar values for objects are a thing of the past. The new system separates the cost of an object across multiple different budgets that are tied to the real engine metrics (we don’t use dollars internally). This really enables Forgers to maximize what can be placed into a level to get the most out of the map. Multi-Budget System – Multiple budgets based on real engine systems; max object counts, memory, etc. This means when placing something like a large terrain piece, its large texture will only eat into the memory budget once, and additional same/similar pieces will only use up the object count budget because their shared texture is already loaded. 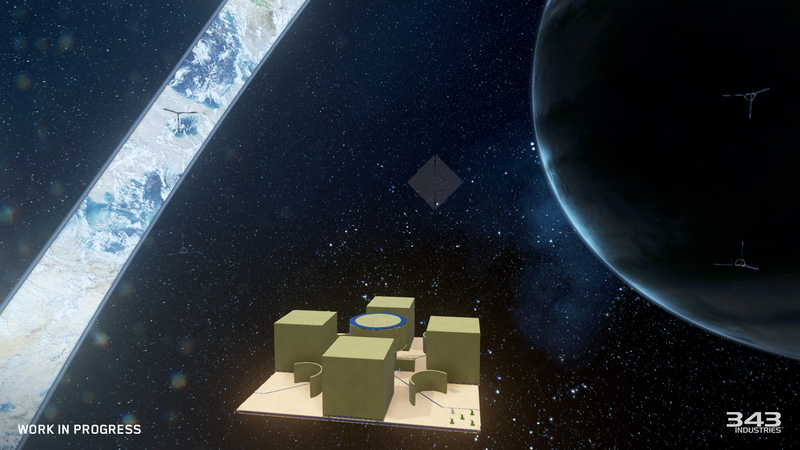 Higher Object Count – We’ve increased the number of objects that can be placed in a Forge map to 1024. Higher object count allows for bigger maps with more detail than possible before. Soft Budgets – Some budgets are “soft” meaning they can be exceeded but will cause visual artifacts/anomalies. This lets you keep building around these budgets to find the fun, then come back later to fine tune things and make the map look prettier. Our lighting system has received a major overhaul. By default the improved lighting techniques will make your maps just look better right out of the box. Additionally our lighting artist Kevin and graphics programmer Adam worked closely together to create additional lighting features to help you make your maps look better than ever. Light Objects – Place real light objects in the world to light up interior spaces or just enhance a location on a map. Light objects have a whole slew of properties; point and spot types, light color/distance/falloff, light cone shape/size, lens flairs, and “gobos” (the pattern projected from the light); customize pretty much every facet of the light imaginable. Light Fixtures – Additional light fixture objects such as light posts, beacon lights, etc. that come with lights built into them making it possible to set dress and light a space at the same time. Opt-in Light Bake – We no longer automatically generate the lighting every time the Spartan is dropped in to test gameplay. Tap the button to quick drop the Spartan or hold it down to render the lights before. Shadow Clamp – Change the clamp to prevent shadowed spots from getting too dark. Another great use for this is when building, it can be cranked up to help keep everything easier to see before doing a lighting pass. 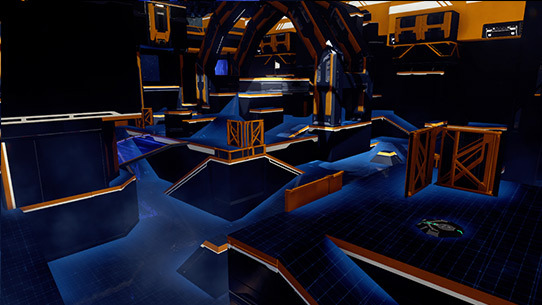 While you can Forge on any Arena/Breakout map, we’ve built three additional large maps custom tailored to maximize Forge-ability. Alpine – A beautiful terrain with rolling hills sandwiched between a cliff side wall and lake front to rip a Warthog down. 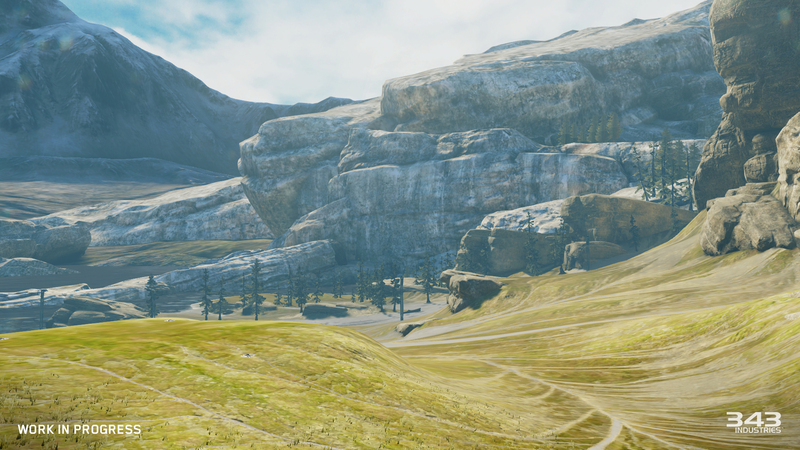 It has that classic Halo world look that feels like a chunk of the Pacific Northwest was transposed somewhere on a distant planet. We even left some space out in the water for building over which is fun. 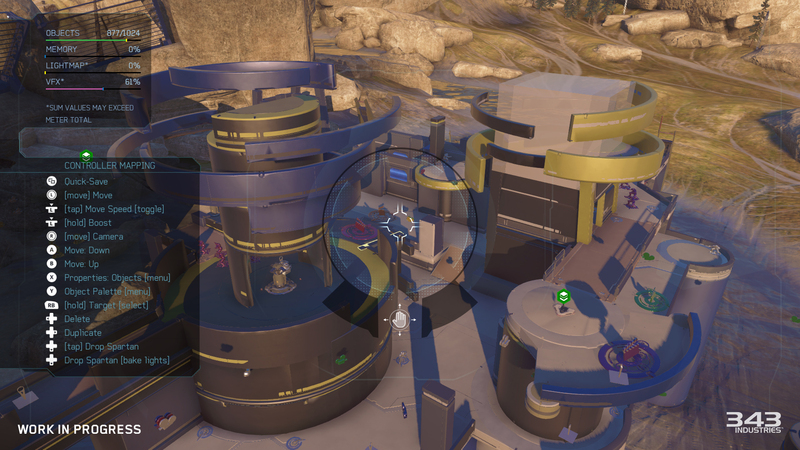 If you played our Halo 5 MP Beta, you would likely recognize this map from both Orion and Pegasus because they were built on top of it in different locations. Glacier – A large snow and ice covered landscape with giant ravine cut down the middle. It’s pretty breathtaking to look at! So much that while it was up on someone’s screen today and Sparth randomly walked by it stopped him dead in his tracks so he could backup and say, “Wow! That looks amazing!” We agree. “Space” (name TBD) – Space has no terrain because, well, it’s space. It’s a big empty map with nothing nailed down but the boundary markers at the edges of the map which go away at game time. It’s pretty much as blank of a map as possible so the sky (or space) is really the limit. Each of these maps has three different lighting themes that change the mood of the map. 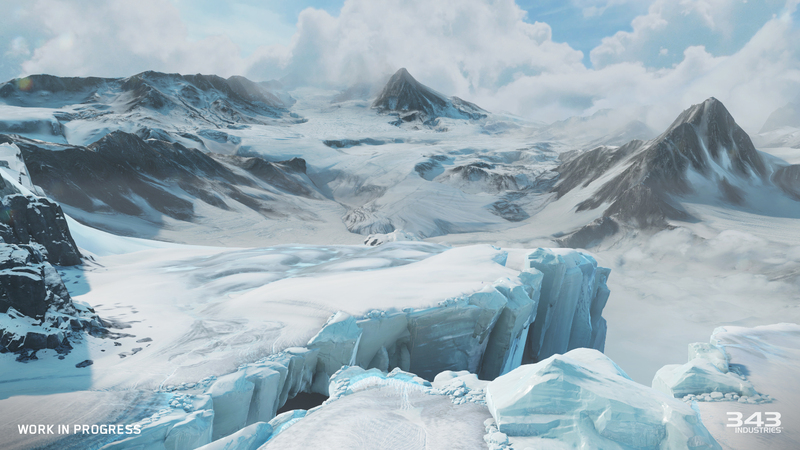 The themes changes general level lighting, background skybox, and other various effects; several of which are tunable in the map settings. The new Forge loves color. Colors add a lot of personalization to levels so we built most of the Forge pieces to really maximize their color customization options on them. Primary, Secondary, & Tertiary Colors – The vast majority of the Forge building pieces have tunable primary, secondary, and tertiary color change sections on them. This allows objects color variations from the blatantly oblivious to very subtle. Many also support changing the matte/metallic reflective properties of the color surface as well allowing for more visual variety from location to location. 100+ Colors – We have more colors in Forge this time than most people had in their crayon boxes growing up; representing a wide range of shades and hues from across the whole color spectrum. Reference Colors – Objects placed in the level generally pre-assigned come with colors that point to “reference colors” that are tunable in the options. Changing these colors in the map settings will immediately update the colors on all of the objects referencing them. It’s a great way to experiment with map coloring quickly and easily without having to edit a bunch of individual objects. There’s almost nothing that hasn’t been touched in this new Forge. In fact, I can’t think of anything we haven’t touched in some way shape or form to improve it in at least some way. Here’s a little list of some of the stand out revisions. Scripting Redux – Almost every object in the new Forge can be scripted to move around, change colors, send event messages to other objects, spawn itself, and all kinds of other fun things. Objects can have up to four scripts that with a condition that will trigger an action when the event conditions are met. We even include a “logic switch” condition type that can wait for multiple conditions to be met before the action is triggered. It’s all super powerful and we can’t wait to see the crazy ways it gets used by the community. Redesigned Menus & HUD – The property menus have been reorganized around objects, map, and tool settings to keep related options and actions in intuitive places. Menus have controller shortcuts to help quickly jump through them. Objects are organized into the palettes in multiple places to help sift through the giant list of objects to find the right set of things to place. HUD content has been refocused around the new features to make sure it’s easy to know how many objects are selected, current grid settings, etc. Advanced Object Translation/Rotation Tools – Move and rotate objects based on world axis or based on own orientations, reset objects rotation with a button press, and more. There’s pretty much an option to manipulate objects even in the strangest/special case situations. Show All Boundaries – Turn this on when building perimeter kill volumes to help see all of them at once so it’s easy see how they all overlap and interact with one another. Our little team is crazy obsessed with making this Forge the best it can be. We often agonize over the thousands of details that generally the player will not even notice because it just feels like it should. This list doesn’t cover everything, but it should at least give you at least a solid understanding of where we’re headed. While there’s a ton of new features to digest, I say “headed” because we have long term goals to achieve with Forge and this is just the start of things to come. 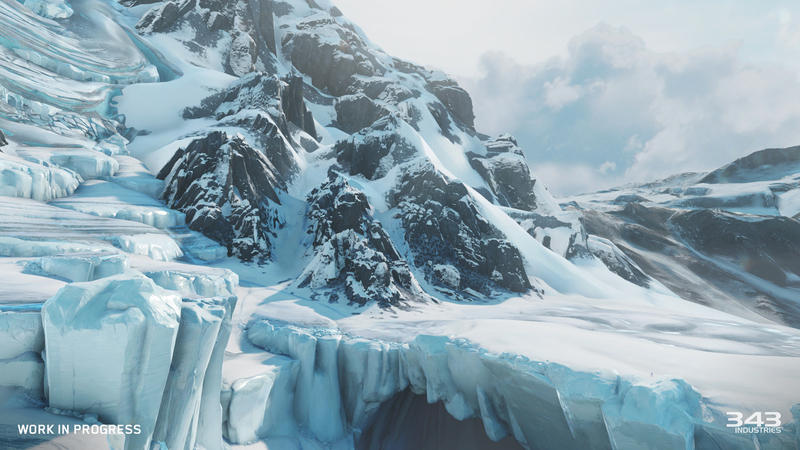 This week, we’re shining the spotlight on more community-made Forge maps. As mentioned above, we’ve been looking for some new favorites to throw into matchmaking, and… we also just like playing your cool stuff. Let’s take a look at a few of our picks for this week. To download any of the below maps, just follow or send a Friend Request to the gamertags below, and view their File Share in Active Roster. The Big Team Battle Community Refresh is now live! With twelve updated maps and the addition of four brand new maps, this refresh is the largest update to a playlist in Halo 5 to date. Before we dive into each map, we’d like to provide a quick glimpse at how this update came to be.